The chance of returning to a normal weight after becoming obese is only one in 210 for men and one in 124 for women over a year, research suggests. 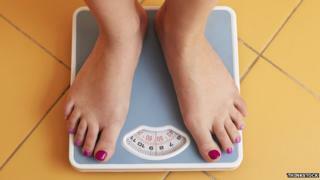 For severe obesity, shedding excess weight in a year is even more unlikely, a study of UK health records concluded. Researchers say current strategies for helping obese patients are failing. A team from King's College London is calling for "wider-reaching public health policies" to prevent people becoming obese in the first place. Lead researcher Dr Alison Fildes said the main treatment options offered to obese people in the UK - weight management programmes via their GP - were not working for the vast majority. "Treatment needs to focus on stopping people gaining more weight and maintaining even small levels of weight loss," she said. "Current strategies that focus on cutting calories and boosting physical activity aren't working for most patients to achieve weight loss and maintain that. "The greatest opportunity for fighting the obesity epidemic might be in public health policies to prevent it in the first place at a population level." The research tracked the weight of 278,982 men and women between 2004 and 2014 using electronic health records. People who had had weight loss surgery were excluded. During the study, 1,283 men and 2,245 women got back to a normal body weight. For obese people (with a Body Mass Index of 30 to 35), the annual probability of slimming down was one in 210 for men and one in 124 for women. This increased to one in 1,290 for men and one in 677 for women with morbid obesity (BMI 40 to 45). Dr Fildes said the figures for losing 5% of body weight were more encouraging - one in 12 men and one in 10 women managed this over a year, although most had regained the weight within five years. And more than a third of the men and women studied went though cycles of weight loss and weight gain. Co-researcher Prof Martin Gulliford of King's College London said current strategies to tackle obesity were failing to help the majority of obese patients shed weight. "The greatest opportunity for stemming the current obesity epidemic is in wider-reaching public health policies to prevent obesity in the population," he said. The research is published in the American Journal of Public Health.